Over the last several years we have been working with experts in the field of productivity along with a very passionate and vocal customer base to develop a world class productivity tool to help ease the burden of information overload. Along the way, we have collected a series of best practices for managing information and squeezing more productivity out of the day. 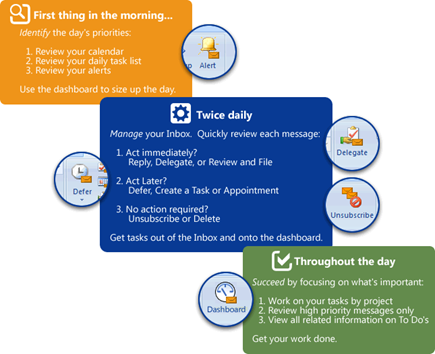 We believe in the benefits of productivity methodologies such as Total Workday Control and Getting Things Done. The IMS Daily Workflow doesn’t replace these methodologies, but rather provides a framework to hit the ground running with IMS. We still recommend that you take best practices from all of these methodologies to find something that works best for you. The IMS Daily Workflow is the culmination of years of development with our customers via product and process feedback, forum participation and weblog conversations. We will be expanding each of these steps in great detail via the weblog in the coming months. In the meantime, check out our Solutions Pages for more detail. Posted by brad at 9:06 am on November 28th, 2007.